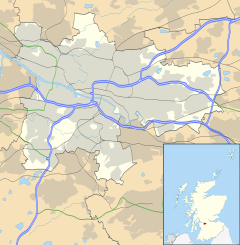 Hamiltonhill is a residential neighbourhood in the Scottish city of Glasgow, situated between Possilpark to the north and east and Port Dundas to the south. To the west of Hamiltonhill is a nature reserve bordering the Forth and Clyde Canal'a Glasgow Branch section (with Firhill Stadium on the opposite bank). The area consisted primarily of Rehousing (low build quality) grey reconstituted stone tenements from the 1930s. Many of these blocks were refurbished in the 1990s, but by the 2010s almost all had been demolished. Some cottage flats dating from the same period were retained, with the result that several small pockets of surviving homes were surrounded by empty waste ground in every direction. In 2018, the local Queens Cross Housing Association published a renewal masterplan for the area involving over 600 new homes. ^ "Glasgow Corporation Housing Department (later Architectural & Planning Department, Glasgow Corporation)". Dictionary of Scottish Architects. Retrieved 28 September 2018. ^ "600 new homes planned for north Glasgow". Evening Times. 25 April 2018. Retrieved 29 September 2018. ^ "A new future for Hamiltonhill". Queens Cross Housing Association. Retrieved 29 September 2018.